TEAC CR-H700DAB review | What Hi-Fi? The first wave of AirPlay-enabled products has been dominated by Marantz, Denon and B&W, but a huge number of other manufacturers are keen to get in on the act. TEAC is going for it more than most, with a new ‘Reference’ line-up that includes a dedicated dock, a streaming DAC and this CR-H700DAB micro system. Disappointingly, the TEAC doesn’t make an especially exciting first impression: there’s something a little last-gen about the brushed aluminium finish, while the two-line fluorescent display looks low-tech next to the big high-res screens of the Marantz M-CR603 and Denon CEOL. Of course, we’re not really here to judge aesthetics, but the display does limit the amount of info the machine can divulge. 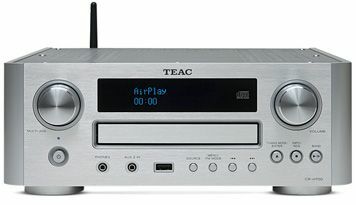 On the plus side, while the TEAC costs £50 more than its key rivals, it has built-in AirPlay and wi-fi. Our main concern is the sound quality, though – and the TEAC has a lot going for it. Play the driving rock of Foo Fighters’ Rope and it delivers serious punch. There’s loads of excitement and enthusiasm here, with solid precision through music’s midrange and treble, and highest notes that stand out without harshness. There are a couple of flaws, though. While it’s capable of producing deep bass with plenty of gusto, and vocals with weight and solidity, there seems to be a point in the upper-bass area where the TEAC goes soft and quiet, leading to a slightly uneven performance. And while the TEAC’s attack is very welcome, rival devices at this price manage to combine that with more clarity and fluidity; the CR-H700 is a touch disjointed incomparison. AirPlay is the big talking point, of course, and here the TEAC makes a good case for itself, delivering Bon Iver’s Perth from an iPhone with lots of detail and dynamic nuance. The direct digital USB input is unsurprisingly that bit better, while CD is a step-up again, but the closeness of the sound quality between the three delivery methods is impressive in itself. What’s more, unlike its rivals, the TEAC’s network streaming capabilities extend right up to 24-bit/192kHz files, and while a system like this is never going to wholly reveal the added subtlety of such a high-res recording, it’s a welcome addition. On the flip side of the streaming coin,there’s no direct access yet to a music streaming service – the Denon CEOL and Marantz M-CR603 both offer Napster, after all. While the TEAC isn’t far off the Denon or Marantz overall, it falls short of them in just enough areas to cost it a fifth star.